I don’t know what it was exactly, whether I had possibly seen those characters somewhere before or I was just drawn to them. I started checking the books out on a regular basis. My parents took notice and decided to rent the films. From then on I was hooked. In 1997 I got to see Star Wars on the big screen for the very first time in celebration of the 20th anniversary special edition films. I got to see Episode II in IMAX, Episode III at midnight, and Star Wars in concert last year. Then in 2008 the best thing that could ever happen to a Star Wars fan happened to me: I met George Lucas. 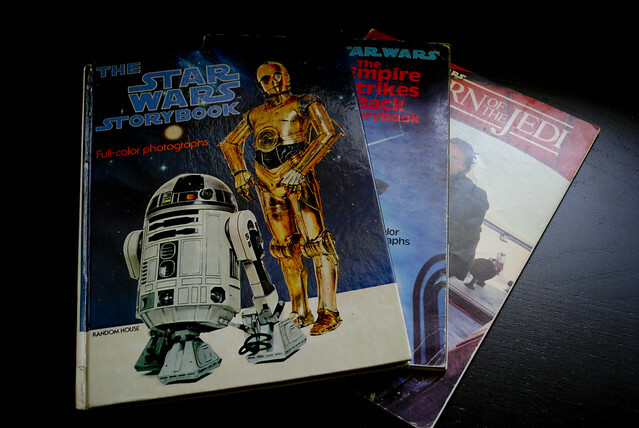 In honor of today being Star Wars Day, I’m going to share some of my favorite Star Wars things I’ve discovered over the years. I know there’s a ton more out there (stuff I can’t think of right now off the top of my head), especially cool merchandise on ThinkGeek.com. Feel free to share some of your favorite Star Wars things you’ve found!